Among the top sights to see in Cabo is the El Arco de Cabo San Lucas, or the Arch of Cabo San Lucas. It is a distinctive rock formation that can be found where the Pacific Ocean meets the Sea of Cortez. In 1974, the Mexican government decided to create an infrastructure that would help Cabo San Lucas become the tourist hot spot that it is today. Cabo San Lucas plays host to the world's largest marlin fishing tournament. Gray whales migrate from Alaska and Siberia to the warmer waters of Cabo San Lucas between the months of January and March, thus providing Cabo's winter visitors with excellent whale watching opportunities. Cabo San Lucas averages more than 350 days of sunshine every year, and its peak tourist season is the November to May period. Cabo San Lucas first began attracting tourists approximately 70 years ago. It was the spectacular deep sea fishing that people originally came to enjoy, but it didn't take very long for area's other wonderful attributes to come to light. 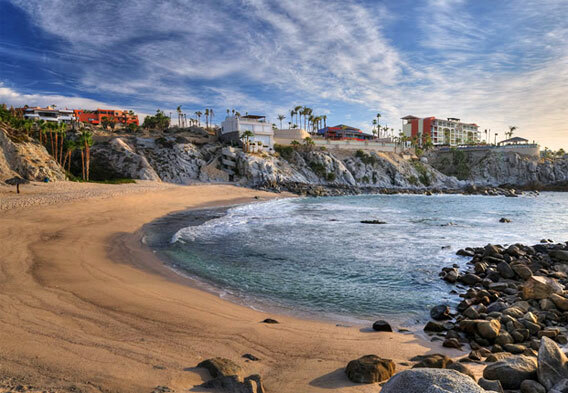 Cabo, as the city is known for short, is a place where you can arrange world-class scuba diving adventures, and surfers are sure to find favor with the consistent year round waves. Other options for things to do in this rather exclusive vacation destination include whale watching, golfing, sea kayaking, parasailing, catamaran cruising, shopping, and dining on fresh seafood. Of course, spending time on the beach is something that many Cabo visitors also look to add to their agendas. Also, it isn't difficult to arrange both water and land-based nature tours in Cabo San Lucas, and if you like beautiful sunsets, then that is just one more reason to visit. Add in the lively nightlife, and it only becomes clearer that this is a destination that has everyone covered. The town is the gateway to the Gulf of California a protected UNESCO World Heritage Site. Thanks to its location at the southern tip of the warm and arid Baja Peninsula, the Mexican resort city of Cabo San Lucas enjoys some pretty fantastic year round weather. The average high temperature for any given month exceeds 70 degrees Fahrenheit, and during the winter, the average lows top the 50 degree mark. Precipitation is pretty scarce, so it's not common for rain to put a damper on Cabo vacations, though it should be noted that hurricanes can move through the area. The city is the southernmost stop on Highway 1, so driving there from the United States is possible. The drive from San Diego to Cabo takes most people a few days. However, most tourists prefer flying in; Cabo flights arrive at the Los Cabos International Airport. This airport also serves the quieter, nearby city of San Jose del Cabo, which is linked to Cabo San Lucas by the 20-mile-long Los Cabos Corridor. Found along the Corridor are such things as beach resorts, golf courses, and gated communities, and it is where many tourists spend a good amount of their time. Managed by Island Global Yachting, the Marina Cabo San Lucas features no less than 380 slips and can accommodate boats that are up to 200 feet long and have a maximum draft of 12 feet. The amenities for visiting boaters are plentiful, and it's hard to argue with the marina's location. Within easy reach of the slips are restaurants, shops, and other entertainment venues. 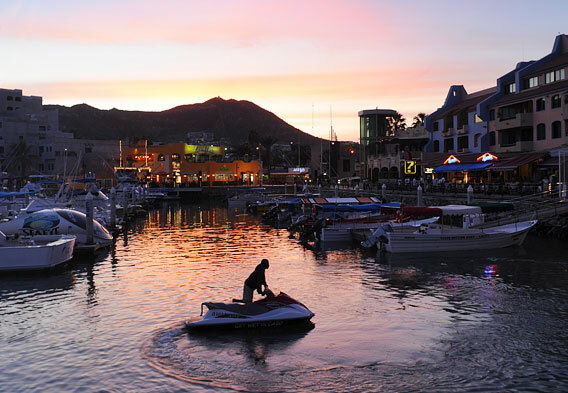 Cabo visitors without their own seaworthy vessels can always look to arrange fun boating excursions at the marina. Also of interest are the marina's sportfishing tournaments. Among the fish that are targeted during these tourneys are marlin, wahoo, tuna, and dorado. Cabo San Lucas is Baja California's top place to go for some lively nightlife. After the sun sets over the city, which it often does in grand style, the bars and restaurants that face the marina or that can be found along Marina Boulevard start to come alive. 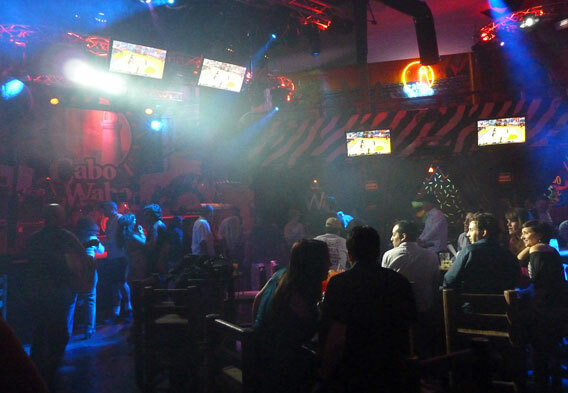 As the night wears on, such renowned Cabo nightclubs as the El Squid Roe and the Giggling Marlin are where many nightlife enthusiasts end up. The dance club scene particularly heats up after midnight, and being that this is Mexico, a healthy number of club patrons choose to fuel their late night frenzies with tequila-based beverages. There are several Cabo San Lucas resorts to choose from for those interested in going the resort route. The majority are found along Medano Beach and along the Los Cabos Corridor. 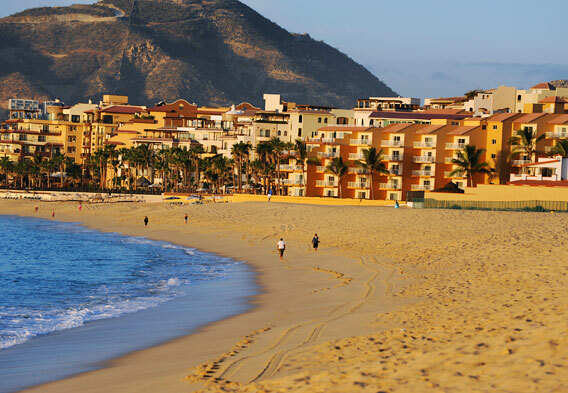 Medano Beach is closer to the heart of Cabo, and generally speaking, its resorts are cheaper than the Corridor resorts. As is true of Mexico's other top beach vacation destinations, Cabo San Lucas has its fair share of all-inclusive resorts. An example is the luxurious RIU Palace Cabo San Lucas, found along the Corridor. Other top rated Cabo San Lucas luxury resorts include the Capella Pedregal, the Welk Resorts Sirena Del Mar (pictured), and the Esperanza. Cabo San Lucas is blessed with spectacular beaches. The most popular Cabo beach is known as Medano Beach, or Playa el Medano. Thanks to its harbor location, it is safe for swimming, and visitors can select from a number of water sports activities. Other beaches of note in Cabo San Lucas include Lovers Beach and Divorce Beach. These two are easily among the most picturesque that you will find in the area. Framing them are amazing rock formations. Lovers Beach fronts the calmer Cabo San Lucas Bay and is ideal for swimming and snorkeling, while Divorce Beach fronts the more agitated Pacific Ocean and is not recommended for swimming. Except at low tide, you can only access Lovers Beach and Divorce Beach by water taxi, glass bottom boat, or kayak.